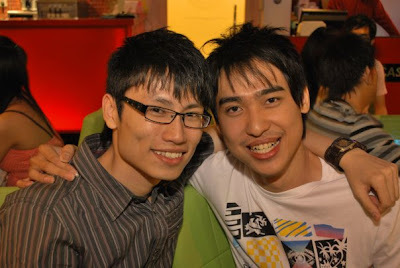 An enjoyable eve at Wing's house which is located in Rawang, with Alvin, Genki, Wing, Yun Ling and Kero. Had fun by preparing the food and drinks, it's not easy when comes to barbecue, especially when you need to set up the fire. Food of the night: Chicken wings, sausages, mushrooms, oranges and watermelon etc. And also soda lemonade, which is prepared by me and Alvin, not bad by the way haha. Since it's Christmas, each of us comes with a present of own choice, and then exchange by lucky draw. I prepared this soft toy as the Christmas present, personally think that it is unique. If you are wondering who's Kero, this is him. He's not an ordinary Snowzer, he's an entertainer! Well trained with tricks that can capture your heart ;) How i wish i hard one, if and only if i have the time and capability to have one. The most anticipated moment - present exchanging session. I got a nice one, which is the red one at the bottom, it's like a hamper which consists of biscuis, chocolate and raisin, i like it. My present drops to Wing, which is suitable for her style. Hope she likes it too. This is how I celebrate my Christmas 09. Did you enjoy yours? Another visit to Bukit Mewah Club - 21st Century steakhouse, it's located at a small hill in Kajang, in where you can enjoy night view of KL while having affordable steak. Maryland Chicken Chop is a must-try when you pay your first visit here, it's served with a large portion of fried chicken chop, and not to forget its golden banana, at only RM12.90! 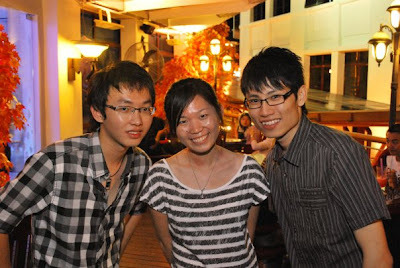 Another outing with Alvin and some of his new friends, at the night before X'mas eve. (is it called X'mas eve's eve I wonder) Our main purpose is to watch 3D Avatar in Midvalley, but luck doesn't seems to be on our side, it's FULL, same goes to The Garden's GSC Signature. And so we changed our plan to Italiannies, The Garden. Went to our last station - Lekca Lekca, which is located around Starhill Gallery. 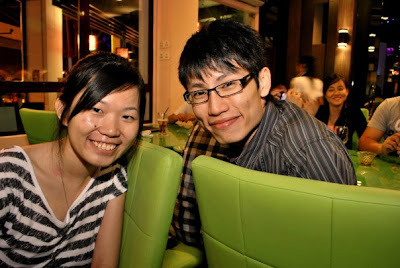 Ice-cream was just so so, with bad attitude of one of the waiters, but still, it's a nice and enjoyable night. SLURRRP ... highly recommended for those who haven't try it out before. Last station of the day - SS2 foodcourt. Grilled tom yam fish with lady fingers, delicious for those who don't mind to explode their head up, because it's REAL HOT. Affordable price yet HO CHIAK, thumbs up. Enjoy a walk at SS2 night market, bought some biscuits and a pack of Tako, which is one of my favourite. And that wraps up my Monday night. Anticipate more fun to come, life is short, live it up! 1218 - a date which is easy to be remembered, jienhau's birthday! Happy belated birthday to you bro. Went to Happy4season house for celebration. The environment and decoration is good, just that the food is so so for me. 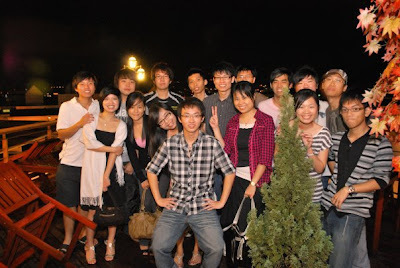 More than 15 friends present that night, we had a nice chat and photograph taking session. Some snap shots of the night. Should be a working as event crew for an event in Sunway Pyramid today, too bad my yet-to-be-recovered foot does not allow me to do so. Instead of sitting at home and wait for the time to fly off, I decided to do some little house keeping work for my Kajang house. If I did not clean my room today, I won't have found this special box - a box that keeps all those good memories of my secondary life. Although it's small, but each of every item inside it means a lot to me, like photos, handmade gifts, letters etc. It dig out part of my old-time-stories which build up the Jason today, from chapter to chapter, each chapter is brought upon by a special one in my life. Never realize I have so many letters in this box, I was a good writer perhaps? It was a trend of making pen pals and exchanging letters years back, but sooner after, email, sms and even msn replaced this tradition as a more convenient communication tool. I miss the feeling of communicating by letters, it needs heart and sincere to come out with a letter. I remember I used to write letters during night time, just before I sleep and after I bathed, because that is the only time my heart will feel peaceful and without disturbance. Maybe I'm the only one who think so, it's my habit to think a lot before off to dream, and it causes insomnia occasionally. Too much of personal thoughts at this moment, let's back to the box that I have found. Those are the tags that I have collected during these 4 years in university, especially the first two years where I was seriously into society work. Being involved in different kind of activities, from in-campus to out-campus events, did improve my soft skills. The last thing I found is the SPIDERMAN !! A birthday gifts from my dearest Chin Leng and Yee Wen. I was so in love with spiderman, and they gave me this =) I will never forget these two buddies. Went to car saloon to have my car bathed, after so many weeks @@ that's how my Sunday goes by. What about yours? It's the first day of "Giordano Nothing above RM10" sales at Queen's Park. I'm sure everyone will feel excited when saw this advertisement, how to get clothes for just RM10? not even in pasar malam. So I went there with some friends of mine, right before 12pm, hoping to get some nice and cheap stuffs. It's just a small shop, which is rent out temporary for this sales. Imagine more than 50 customers in a shop lot, hot hoT and HOT ... It might as well increase the chances of getting A influenza.